Register Here for Standard option after Aug 15th. are some of the hardest to attend because there are not too many of them. And double down on scarcity as the ones that are available are usually not close by. School of Permaculture and Permaculture Mexico solve both of these problems, and are making your desire to learn natural building possible by putting together a two week earthbag building course this September. From START to FINISH! 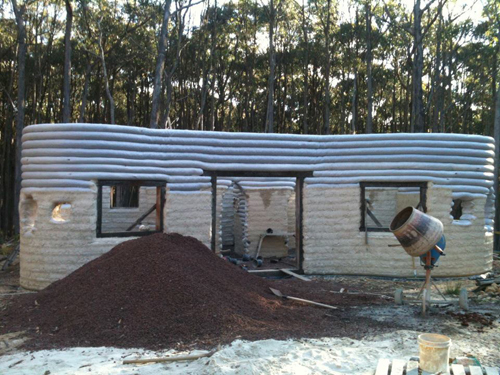 We will be creating a curved walled, metal roofed earthbag house. 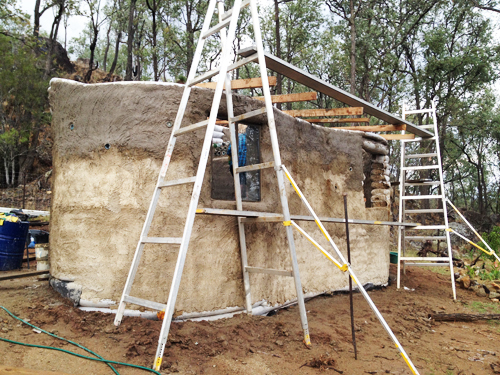 Most traditional earthbag buldings are created with a dome. So this is a desirable opportunity because we wanted to add a metal roof for the practicality of catching rainwater for both potable and irrigation use. We invite you on this rare mission to learn earthbag building techniques from two great organizations, School of Permaculture and Permaculture Mexico. 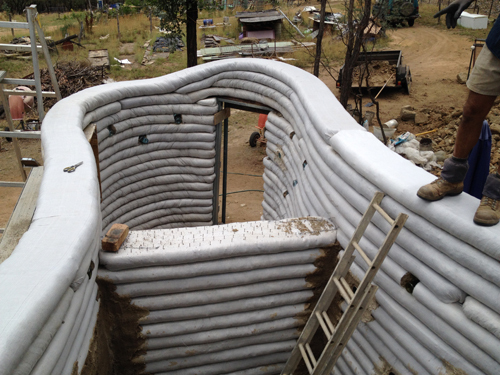 Anyone who’s been interested in building an earthbag building, but has never seen one go up in person. See it start to finish. An experienced builder who wants to learn all the ins and outs of earth bag construction. 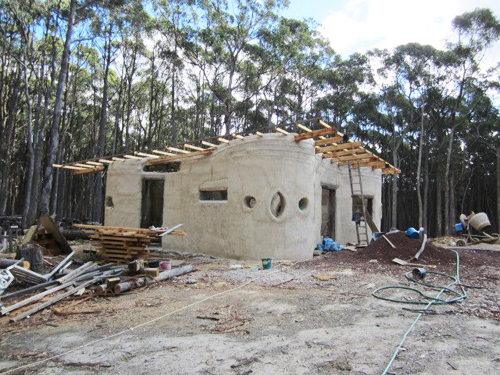 Anyone wanting to save money and energy making their own earthbag home, learn on someone else’s property, before doing it yourself. Anyone who’s NEVER built anything before thinks they are a little crazy for even thinking about building their own. Anyone who’s already designed their own home, already started to build and is running into questions/challenges. 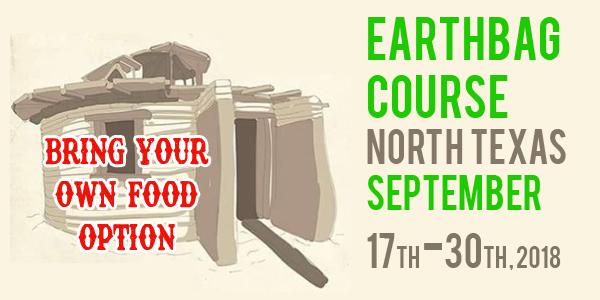 Come meet professional builders and those who are also interested in building earthbag buildings. 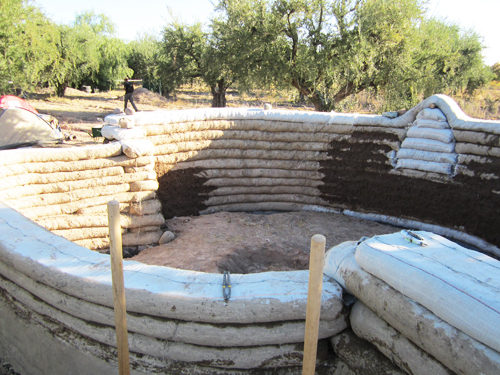 This earthbag build will take place on our nascent farm in Ben Franklin, Texas. That is about half way in between Commerce and Paris Texas. Our farm does not have an address yet but when you register the gps coordinates and directions will be emailed to you. There will be a space available for parking on the farm and on side of the road. Camp on our 55.64 acre nascent farm site. Outdoor shower and bathroom facilities will be available but rustic. Stay in a hotel in Commerce, Paris, or Cooper, TX and drive to site each day. Each day breakfast, lunch, and dinner will be provided by a third party to make sure we got quality fuel for our awesome work load. Nicholas, founder of School of Permaculture, met Jose (founder of Permaculture Mexico) at a permaculture design course in Melbourne, Australia. Jose was teaching assistant and caretaker of Bill Mollison (founder of permaculture) at the time. The two have stayed in contact and Nicholas wanted to see his friend again along with working together to demonstrate strong collaborative strength across countries and cultures. Jose is a teacher of earthbag construction and has taught at Cal-Earth (the organization tasked to carry on Nader Khalili’s work). 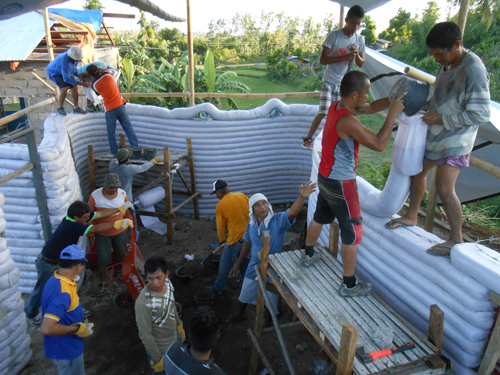 He works in many places around the world training and setting up earthbag buildings.